There’s a saying, “Any book is new until you’ve read it.” This could apply to recordings as well. Here’s a CD from 2014 from Arbors Records featuring multi-instrumentalist Adrian Cunningham playing the music Neal Hefti. 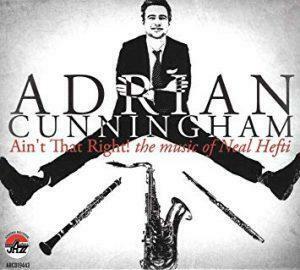 It’s a small-group recording with Australian native Adrian Cunningham on clarinet, tenor saxophone and flute. Wycliffe Gordon plays trombone on four of the thirteen numbers. The rest of the ensemble includes pianist Dan Nimmer, bassist Corcoran Holt, and drummer Chuck Redd. Pensacola area residents had opportunity to see Cunningham and Wycliffe Gordon live performing with Pensacola Symphony this New Year’s Eve. Gordon was the featured attraction and he brought his small group which included Cunningham, pianist and drummer. Our own area bassist, Steve Gilmore filled in for the scheduled bassist who was unable to attend. Gilmore reported a superb overall performance both from the symphony as well as the Gordon ensemble. He indicated that Gordon had written all the symphony charts as well. I’m pleased to report that Rachel Domber, head of Arbors Records, tells me that she intends to record Mr. Cunningham again this year! We’ll let you know when that CD becomes available.